It is very important to keep your strength up in this game. You must be as efficient as possible in your actions, as there is very little spare food lying about. You don't have to kill all the spirits to escape. There is no way out if you fall to the bottom of the ravine. As a guide, you will find listed the number of spirits you should have killed, the number of keys you should have and your ideal strength rating at the end of each section of the solution which follows. This solution assumes, unless otherwise stated, that you eat all food as you find it, pick up all treasure and kill every spirit you see. Always crawl on ledges, etc. You can move more accurately. Look down at your feet when walking near to the limit of a ledge, etc. Get the Key from the Chest, leave the room and go to the Mouse Trap. Get the Food and quickly shoot both the Spirits. Go to the Last Treasure Room and push the Block through the wall. Go to Tantalus, climb the blocks and get the Food. Push both Blocks through the wall and then return to the Last Treasure Room. Climb the blocks and get the Key to Belenus. Go to the Pot Hole and open the Stone Door (your strength must be at least 'Mighty' to do this). Climb up the steps to the higher levels and eat two wedges of food. If your strength is not now at the maximum level, start again! Go to the Lift Shaft and push the boulder into the corner (you need maximum strength to do this). Now clear the level of all Spirits. Finally, head up the steps to Level 3, and get the Trapeze Key from under the steps on that level. Go to Level 5 and enter the doorway. Open the low door in the Lift Entrance Hall and then shoot the Chair Spirit. Crawl into the tunnel, kill the Mouse Spirit then return for the food in the hall. Crawl along the ledge in the ravine to the point marked with * (below following this paragraph), and crawl off the ledge in the direction of the arrow. You will land on another ledge on Level 6. Enter the Lurking Cheese room and immediately shoot the Cheese Spirit. Go to the Lift Entrance 6 and kill the Chair Spirit. Eat the food and shoot the lock off the padlocked door. Enter the lift, smash the glass and get the Level 4 Key. The lift is now working. Using the lift, work your way to Level 3. On each level, clear the Lift Entrance Hall and adjoining rooms of all spirits. To kill the spirit in the Tube Room on Level 5, you need to drop through a gap at one end of the raised floor area, select 'CRAWL' and then shoot the Cheese Spirit. You now have to get keys from the Lift Shaft and from the Third Floor ledge above the Pot Hole. Go to the Switch Room on Level 3. Press the switch to make the doorway to the ledge appear and go through before it closes again. Crawl off the ledge to left (as you enter the ledge) to land on another ledge on Level 3 above the Pot Hole. Get the key to Level 3 off the wall and go through the doorway. Go to the door in the stair-well on Level 3. Make your way to the Map Room. Shoot the lock off the door on the far wall and then open it. Shoot the switch on the Model Castle to lower the drawbridge. Step onto the drawbridge and close it. You will be catapulted through the door on the far wall. Cross the ravine and return to the lift. Descend to Level 4. Leave the lift and go to the ledge over the ravine. Push the stone slab and it forms a bridge to the opposite ledge. Make your way across and go back up to the Lift Entrance Hall on Level 3. Go through the lift door and you will step out onto the lift roof. Turn RIGHT and walk onto the wooden ledge. Get the Key to the Ground Floor from the wall. Make your way back into the Lift Entrance Hall. Walk all the way back to the bottom of the Lift Shaft (don't use the lift). The lift weight has crushed the boulder and revealed the Key to Level 2. Make your way up the steps to Level 2. Enter the Pillar Room and move the Weight. Go down the tunnel to Secellus and get the Yang Key. Go to the Stalactite Room on Level 3 and push BOTH blocks UP. Return to Level 2, leaving the doors to the Stalactite Room and Trapeze OPEN. Climb the blocks in the Pillar Room to get the Gem then go to the ledge over No Room. Crawl across the tops of the two doors you left open on Level 3 into Ogmios. Enter the Rat Trap Room and shoot the Rock Spirit on the ceiling. 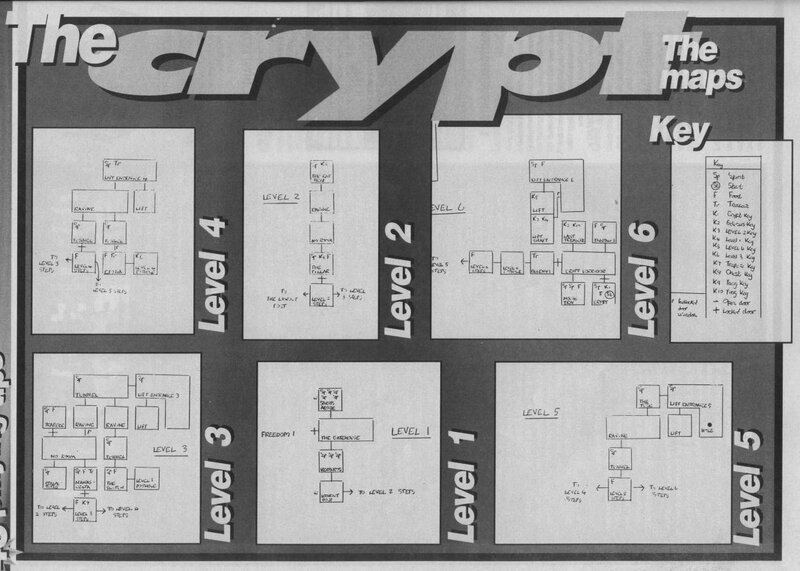 Walk over to the Key and select 'CRAWL'. Get the Key and immediately crawl backwards. You now have the key to the Treasure Chest in the Final Treasure Room. Make your way back to the Final Treasure Room, open the chest and get the Food and the Yin Key. Make your way up the stairs to the top (Ground) level. If you have enough energy, stop and shoot the spirits in the Trapeze and the Map Room (in the flag). Open the door in the Lookout and SAVE YOUR GAME! Select 'CRAWL' and go through the door. To kill Kerburus you must shoot each head SIX TIMES - LEFT first, RIGHT 2nd and then the CENTRE one. You will hear a "pinging" noise if you are on target. Once Kerburus is defeated, go to the door to the Spirits Abode and press ALL the buttons. Provided you have ALL TEN keys, the door will open. SAVE YOUR GAME again! The best way to kill all the spirits is to enter the room and kill one, leave the room and SAVE GAME, then repeat the process until you get them all. When you have killed all the spirits, walk CAREFULLY out of the window. Turn LEFT and then shoot the switch to open the drawbridge and go back inside. Finally, leave via the drawbridge to complete the game!